Our aviation themed STEM education schools program has taken off. Incursion and Excursion bookings available now. AvServe's STEM program meets the curriculum learning criteria. Students will be engaged and participate through team building challenges and practical experience in a professional flight simulator with a trained pilot. Depending on the package purchased, AvServe can provide the In-class Activities Facilitator. Alternatively, the school can provide someone suitable to run the in-class activities. Supervisors (teacher/s or teacher-aide/s) to be provided by the School to oversee the entire day’s program. If the school has opted to provide their own Activities Facilitator/s, the supervision of students could also be done by the same person/s. Teacher / Activities Facilitator will run the in-class activities which includes a UAV (Unmanned Aerial Vehicle), flight planning for a Rescue Mission and designing a paper plane that can physically move cargo’ and supplies. Students work in small groups in the classroom and 4 students (ideally each representing a different group) will take turns to leave the classroom, heading for the Flight Simulator truck to experience being a pilot. In-class Activities Facilitator may be provided by AvServe, or the School may make available a suitable Teacher to facilitate the aviation activities. 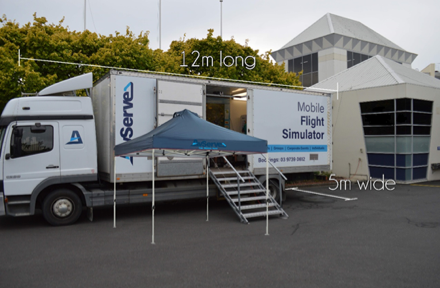 We will bring our Flight Simulator truck and STEM Program to your predetermined venue. See access and parking space requirements in the picture below. AvServe's STEM program structure can be tailored to your needs. A parking area measuring 12m x 5m is required for the truck, along with access to power within 50 meters. Our calendar will be fully booked in the coming weeks. Please call to book your school incursion now. 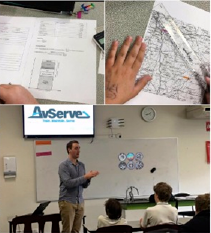 To hear more about our STEM Program and to talk about contextualising it for your school or students' requirements, please call AvServe today on 0427 205 414 .